Q. How do I stop comb filtering when recording in stereo? Arranging mics in a coincident X-Y pair for stereo recording prevents comb filtering. I have been reading the book Mastering Audio by Bob Katz. In it he addresses the issue of the detrimental occurance of comb filtering when recording in stereo and then combining the signals in a single track. 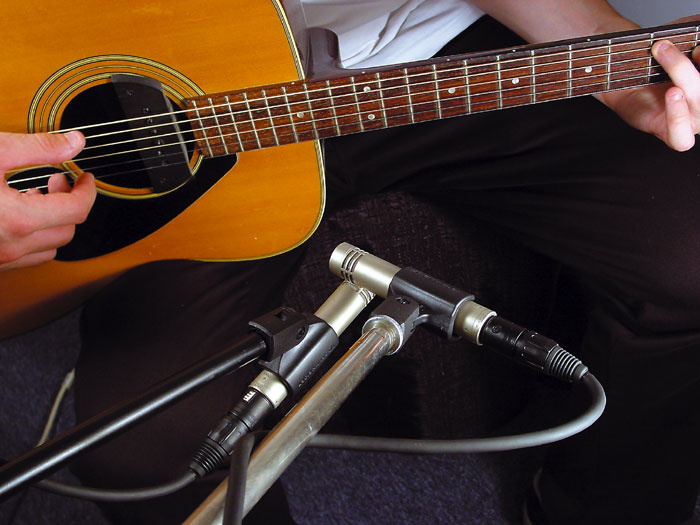 He says that acoustic recording techniques can be used to prevent or minimise the problem, but does not disclose the actual solutions. I was wondering if you could help by explaining what they are? Editor In Chief Paul White replies: It's pretty straightforward — if the same source is recorded with two mics at different distances, the sound arrives at the two mics at slightly different times. When the two mic signals are summed to mono, comb filtering will occur. Whenever you add a slightly delayed version of a signal to itself (where the delay is too short to be heard as a distinct echo), some frequencies will be exactly out of phase and will cancel each other out, while others will be in phase and will be reinforced/emphasised. If you were to look at the resulting frequency response plot, you'd see a lot of peaks and dips in the response that look rather like the teeth of a comb, hence the term 'comb filtering'. Comb filtering is the basis of how flangers and phasers work, which should give you some idea of its effect on the sound. Note that comb filtering is only audible when you sum the signals to mono, so if the recording will only ever be played in stereo, panning the two signals hard left and right will eliminate the problem. But as you can rarely guarantee that no-one is ever going to listen to your finished track in mono, ensuring mono compatibility is usually desirable. To prevent comb filtering, you have to avoid the conditions that cause it. One way is to use coincident microphones rather than spaced microphones for stereo recording so that all sounds arrive at both mics at essentially the same time. Although spaced-mic stereo recording techniques are not entirely mono compatible, they are still popular because of the enhanced impression of stereo that they provide. Spaced mics are also commonly used as drum overheads, but if mono compatibility is important, you may prefer to use a coincident pair over the kit. Comb filtering can also occur when multiple instruments are being recorded in the same room and the individual instrument mics pick up spill from another instrument. It's best to try to arrange the mics so that they pick up mainly the instrument they are aimed at and as little as possible from elsewhere. Given sound sources that are of equal level, you can usually achieve this by ensuring that the distance from the mic to the sound you're trying to capture is less than a quarter of the distance to the next closest sound source. There will still be some spill and so some residual comb filtering, but its effects should be slight. Where both close and distant mics are deliberately used on the same source, as is common in classical recording, it is possible to delay the signal from the close mic to bring it into line with that from the distant mic using a hardware delay box, a digital mixer with channel delays built in, or a delay plug-in, the only proviso being that the adjustment steps should be fine enough to set the delay accurately to the nearest millisecond or better.